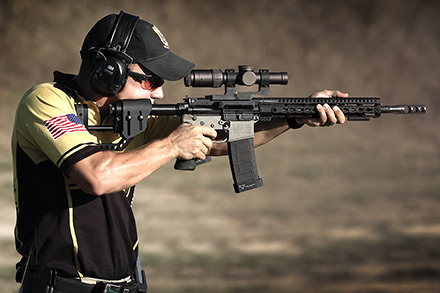 Daniel Horner, a Staff Sergeant from the US Army Marksman Unit recently won the 2014 3-Gun Nation Pro Series Championship using a PROOF Research Carbon-Fiber Barrel. Tulsa, OK / October 25, 2014 – Horner, a Staff Sergeant from the U.S. Army Marksman Unit (AMU) battled 32 of the nation’s top 3-Gun competitors for the National Champion title, including two exciting final man-on-man elimination matches against fellow AMU Shooting Team member, Sgt. Matthew Sweeney. Horner’s win makes him the only competitor to have won two 3GN Championships since the series began in 2010. In addition to his title Horner took home a $50,000 check courtesy of Leupold Tactical Optics and NRA Sports. The Championship was filmed for broadcast later this year on Sportsman Channel and Pursuit Network.